Turn a critical lens on Japan's modernist architecture during this 3-hour walking tour of Tokyo, including Harajuku, Omotesando and Roppongi. A local scholar will introduce traditional and contemporary principles of Japanese design through architecture, fashion and art. During fascinating discussions with your expert guide, you’ll learn where Japanese designers draw their inspiration and appreciate how Japanese ideals of beauty inform their aesthetics. Enjoy personal attention on this small-group tour, limited to 6 people. Meet your guide—a local scholar of art history and architecture—at a central Tokyo location. Your expertly trained guide uses a multidisciplinary approach to help you understand Tokyo’s contemporary visual culture, starting with traditional concepts of Japanese architecture at the Meiji Shrine. Here, you can start to appreciate how the visual landscape of Tokyo has changed in the last 200 years. Dedicated to the Emperor Meiji in the 19th century, the modest aesthetics of this Shinto shrine provide a foundation for discussing the contemporary design techniques that followed. Spot examples of these newer techniques as you venture to Harajuku and Omotesando, two closely situated areas with quite different representations of Tokyo’s modern design. As you walk through the district of Harajuku, delve into some of the colorful subcultures that Tokyo is known for. Your guide will point out how modern Japanese values and roles are reflected in consumerism and clothing to form social identities. As you move through the neighborhood of Omotesando, notice how luxury brands—Prada and Dior, among others—use architecture as an extension of their aesthetic principles. As a hub for design, fashion and architecture, the famous avenue is dotted with design studios and boutiques, each showcasing their own idea of Japanese beauty. View buildings by great modern architects, such as the Cartier building, the Nezu Museum, the TOD’s building, Tokyu Plaza and Gyre—a mixed-use building for retail and dining. 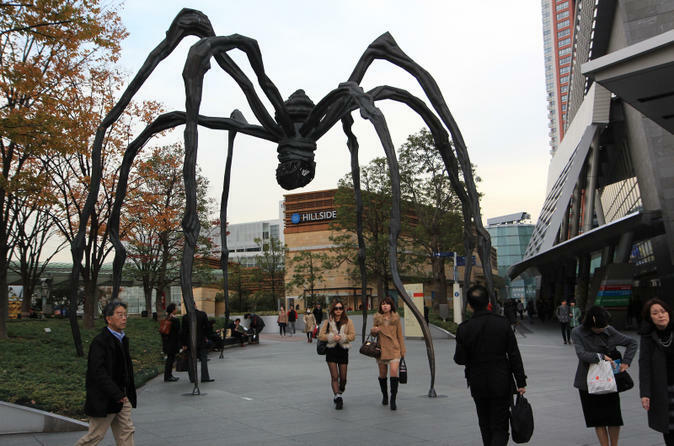 Your discussion in the Roppongi District may include subjects such as superflat, a postmodern art movement exemplified by Takashi Murakami, and modern forms of Japonisme. You might also wend your way toward the 21_21 Design Site, Tokyo’s first design museum and a stunning piece of architecture by Tadao Ando. Complete your walking tour in Roppongi Hills, an urban development that integrates commercial, cultural and residential Tokyo. Real-estate tycoon Minoru Mori—who also created Omotesando Hills and the neighboring Tokyo Midtown Center—has made Roppongi a central hub for contemporary art in Tokyo, punctuated by the Mori Museum at the top of Mori Tower.